Before actually going to Shakespeare Pub & Grille for the first time, I've heard about their amazing, authentic fish n' chips served with peas. Yum! They offered an English breakfast that was heaven! 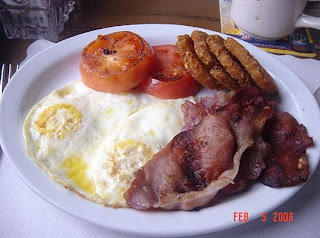 I had the english bacon (rashers), two fried eggs, grilled tomato, and crunchy hash brown potatoes. 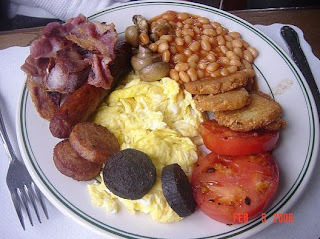 Pam & Louis had the full English breakfast of rashers, bangers, mushrooms, baked beans, scrambled eggs, black and white pudding, hash browns, and grilled tomatoes. Seeing that this was three years ago, I didn't see these two entrees on the online menu, so I'm not sure if they only serve the "All Day English Breakfast" now. It could have been a Sunday morning soccer special! My younger sis, Lani, and I watched a long time ago on TV a documentary on the English breakfast and were so intrigued. There was no dialogue or voice overs, but simply clips of English breakfasts' shown around the U.K. in different areas, rural and urban. Bottom line... gotta have the rashers, eggs, and tomato. Gosh, wish we can see it again!